On this date in 2009, Covenant Orthodox Presbyterian Church in St. Augustine, Florida, was established as a particular congregation by the Presbytery of the South. Two years earlier, the Presbytery of the South had approved plans for the establishment of a “parachute plant” styled mission work in the southern shadow of Jacksonville, FL. Rev. Eric Watkins was called as the Evangelist for the area. Shortly after this, Eric and his wife, Heather, and their two small children, Kirra and Carl, moved to St. Augustine, Florida. The Watkins began to open their home a month after moving to St. Augustine, and started an exploratory “Get to know the OPC” Bible study with just a few families. Pastor Watkins did evangelism and made many new contacts. A larger core group quickly emerged, and it became evident that a facility for worship services would be needed. The Lord provided a cozy conference room at a hotel in the World Golf Village area, and around a hundred people attended the first worship service on May 5, 2008. Now, seven years later, the congregation averages over one hundred and thirty people in attendance for worship. The Lord has also graciously provided the church a six-acre property which has two buildings and sits on a major highway. It is truly wonderful to reflect on the way the Lord has built and sustained his church over the years. With thankfulness in our hearts to our triune God, November will always be a month to remember for the saints at Covenant, St. Augustine. To God be the glory! Editor’s note: Today’s guest author is Ron Lantrip, a ruling elder at Covenant Church. 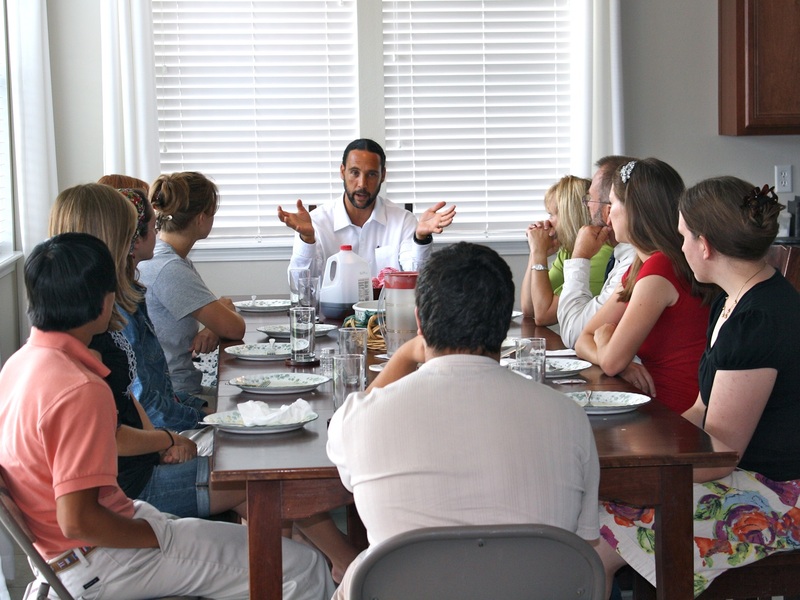 Picture: Pastor Eric Watkins teaching after a meal at the Watkins’ home in 2012.